Microcontroller's are a very important part of any circuit, as they control all the action and working of any circuit and project. If you are planning to make your final year or mini project using a microcontroller, then you really need some good idea's. 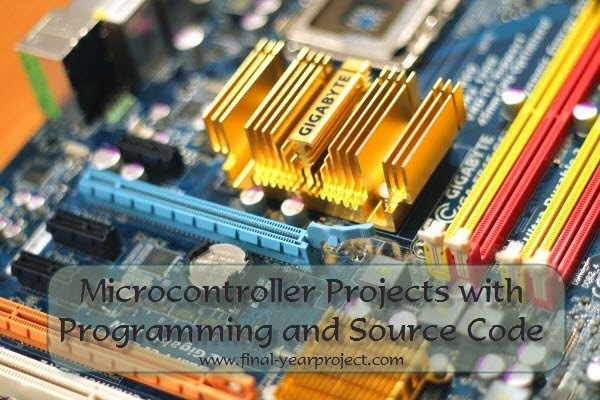 In this article, we are sharing all the microcontroller projects with there source coding and programming. You can also Subscribe to FINAL YEAR PROJECT'S by Email for more such projects and seminar. As per Wikipedia, A microcontroller (MCU for microcontroller unit, or UC for μ-controller) is a small computer on a single integrated circuit. In modern terminology, it is similar to, but less sophisticated than, a system on a chip or SoC; an SoC may include a microcontroller as one of its components. A microcontroller contains one or more CPUs (processor cores) along with memory and programmable input/output peripherals. Program memory in the form of ferroelectric RAM, NOR flash or OTP ROM is also often included on chip, as well as a small amount of RAM. Microcontrollers are designed for embedded applications, in contrast to the microprocessors used in personal computers or other general purpose applications consisting of various discrete chips. These are just a few, we have many more microcontroller projects with full programming and source code. Just keep searching and reading our final year project blog. You can always Subscribe to FINAL YEAR PROJECT'S by Email for more microcontroller projects and seminar.